Technology: Metal Injection Molding Services are manufacturing services which produce metal parts through a combination of injection molding and sintering. In the process, powdered metal is mixed with plastic binders and the plastic is then melted and the mixture injected into a mold. After cooling, parts are ejected from the mold, debinded, and finally sintered to produce parts that are near net shape. Metal injection molding services are characterized as high volume production of small, complex parts. Many metals can be formed using the injection molding process, including stainless steels, superalloys, low alloy steel, and low expansion alloys. Metals that have lower melting temperatures than copper are generally not good candidates for metal injection molding, including aluminum and zinc. Titanium is also not suited to injection molding. 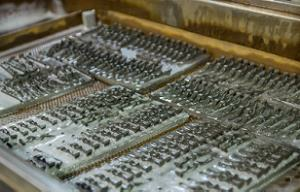 Advantges: Metal injection molding services offer an alternative to investment casting and machining processes.